THIS POST IS ABOUT HARRY POTTER! If you haven't seen Harry Potter 5, navigate away now! Spoilers abound in the following paragraphs! Also...If you don't like Harry Potter or if you think that by reading this you may be turned into a newt, then please stick around! I promise this isn't a pro/anti Harry Potter rant. I also promise not to "geek-out" on you and I promise, promise, promise that you won't be indoctrinated into witchcraft and wizardry just by reading this post! Actually, this post is really more about one character than it is about the book/film in general. Okay, the warning is over...now onto the post. I just finished Harry Potter 5: The Order of the Phoenix (and by "finished" I mean the movie). Yes, I'm watching HP from start to finish with one of the Mangoboys (and for the fun of it, let's call him "Jack"). It is our goal to catch Deathly Hallows Part 1 and 2 on the big screen. Overall, I've enjoyed the stories as they follow the classic storyline of good versus evil, redemption, hero/villain, with some enjoyable twists. In book/film five of the story, they have introduced a fantastic new character: Dolores Umbridge (pictured here). I won't overwhelm you with the whole HP story, but Professor Umbridge has been appointed to Hogwarts School by the Ministry of Magic as an agent of change at the school. As I watched her character develop in this movie, I couldn't help but laugh at some similarities she shares with a few characters whom I've met in real life. On first glance, you know Dolores is different. Instead of the typical black robe worn by students and teachers, Dolores shows up in a tailored pink wool suit complete with a flowery pink pill box hat and matching handbag. She looks like a spokeswoman for Pepto-Bismol. Visibly, she is the antithesis of what wizardry and witchcraft look like. Her first words to the student body give you a hint as to why she has been brought to Hogwarts. "Progress for the sake of progress must be discouraged...let us preserve what must be preserved...let us perfect what can be perfected...and let us prune practices that ought to be prohibited." Spoken with a tight smile and a syrupy sweet British accent, you know she is going to be at odds with at least the students and most likely the administration. I'll get back to her "pruning practices" in a moment, but I want to begin with her first day in the classroom. "There Is Nothing Out There, Dear!" Dolores Umbridge:"Your previous instruction in this subject has been disturbingly uneven. But you will be pleased to know from now on, you will be following a carefully structured, Ministry-approved course of defensive magic. Yes?" Hermione Granger:"There's nothing in here about using defensive spells..."
Dolores Umbridge: "...You will be learning about defensive spells in a secure, risk-free way." Harry Potter: "Well, what use is that? If we're gonna be attacked it won't be risk-free." Dolores Umbridge:"It is the view of the Ministry that a theoretical knowledge will be sufficient to get you through your examinations, which after all, is what school is all about." Harry Potter: "And how is theory supposed to prepare us for what's out there?" Dolores Umbridge:"There is nothing out there, dear!" Please tell me you caught what I caught here? Maybe it's just my experience with uber-conservative Christianity, but there are several aspects to this character that I found to be humorously analogous to some branches in the Christian Homeschooling Tree. Here is what I caught: Theory versus reality. Risk-free environments. Professor Umbridge focuses on teaching these Hogwart's students the theoretical knowledge of dealing with evil, but refuses to provide them any real skills or experience for engagement or defense. The comparison I found is simple. Christian homeschoolers (and I'm one of them) have plucked their kids from the public school system. Theory of engagement with the world is and should be taught, yet for some families that is where they stop (and this is where I swing down a few branches on the tree). Here's what I've personally witnessed: These families never use their training in the real world. In an "us vs. them" mentality they continue to sterilize their children by raising them to avoid any engagement with the world. They disengage from anything to do with popular culture instead of entering the culture equipped with a Christian worldview and practicing the skills of defense (read: Gospel living). After pulling away from the philosophies of the world, they never return to engage the world with sound Biblical philosophy. Even after equipping their families with the tools to engage, their energies are spent avoiding the world and living in a "secure risk-free way." Like this example from Professor Umbridge at Hogwarts School, these parents never intend on letting their students leave the classroom. After only a short time at Hogwarts, the Ministry of Magic expands the Pink Professor's role at the school: "Having already revolutionized the teaching of Defence Against the Dark Arts, Dolores Jane Umbridge will, as High Inquisitor, have powers to address the seriously falling standards at Hogwarts School." Here is another place where I found that art intersects reality. Dolores becomes both a teacher and a clipboard carrying inquisitor. She is often seen interrupting classes in session and challenging what and how other instructors are teaching the students. One of my favorite scenes shows Dolores using a tape measure against the choirmaster to literally see if he "measures up." Hello? Can we find similarities with this clipboard carrying inquisitor within our own experience? How often have I picked up the clipboard and tape measure? Too often. We don't need to look too far into the Christian homeschool community or even some of our churches or some of our own lives (there I said it...) to find the behavior we see displayed in Dolores. On the outside, she projects perfection. Tailor-fitted clothing and a matching pink office with walls covered with photos of cats (yes, she is the ultimate "cat lady"). Visitors are escorted into her office and served a hot cup of tea. Dolores appears kind and hospitable (afterall, she's doing things right! ), yet without skipping a beat, she politely shows where her guest has not met the standard and all the time smiling and sipping tea. Comparisons. Pride. Inquisitions. This doesn't just happen at Hogwarts people! This happens around our kitchen tables (and sometimes around our communion tables...ouch!). We are reminded in Proverbs that God hates a proud look and one who has haughty eyes, yet this behavior comes so easily to us as Christian homeschoolers. With little effort we can all become like Dolores. We pick up our measuring tapes and evaluate one another according to a standard that we have created and others simply cannot keep. How easy it is for us to become pink-washed tombs? Ha! After her instatement as High Inquisitor, Dolores also focuses her attention on student behavior at Hogwarts. With a down-turned eye, she instates a series of new decrees to the Hogwarts student body. Clothing standards, relationship standards, how to talk, how to think, how to live...nothing is outside of her reach. With each declaration, she frames the edict and her lackey assistant nails it to the school wall. As her laws multiply so does the difficulty to police student behavior. Dolores solves this by recruiting several Hogwarts students to serve on her Inquisatorial Squad and rat out classmates whose behavior is out of line. Within time, there is a new law for every behavior and the school wall is covered with framed decrees. Students are driven to misery until the inevitable finally happens. In the movie, a comical student revolt is led and Umbridge is driven from her post at the school. As the lawmaker flees the auditorium, the framed laws shatter away from the wall (see photo below). Legalism is tricky that way. You can't stop with just one law (like Pringles potato chips). Laws have a funny way of multiplying and soon they are hard to keep track of, let alone keep. Yet there are families trying to manage behavior every day with external systems and rules. It's impossible. I've tried. I've witnessed it in church and in the homeschool community with my own two eyes. I've seen kids that were seemingly well controlled for years finally revolt. I remember reading an article a few years ago about kids who "jump ship" and reject a system based on meaningless rules. I've seen it and when they jump, they jump far away and land running! Lists of right and wrong behaviors will serve to frustrate children, not encourage them. Dolores Umbridge had rules, plenty of them. What she lacked was a relationship with her students and a desire for them to grow and learn and apply their learning in real world situations. They never were allowed to take their education and use it outside of the classroom. 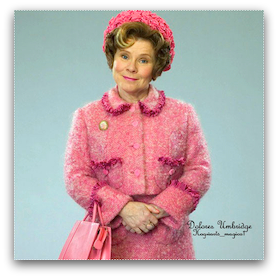 Oh how I loved and hated the character of Dolores Umbridge. 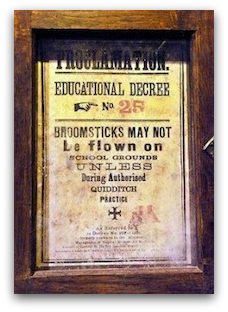 What an example of how not to run a school of witchcraft and wizardy! PS...see, you didn't turn into a newt!